Tackle the challenges of planning and implementing a skill-based routing solution. You'll learn how to define customer needs, how to define agent capabilities, and determine skill-level-based prioritization. You will analyze different SBR design concepts through case study applications and learn how to incorporate skill-based routing into your contact center environment. The program WFM - Skill Based Routing is also included in the bundle Call Center Staffing. This interactive e-learning course provides best practices for designing a skill-based routing (SBR) system in both a traditional and multi-channel contact center environment while incorporating SBR into the forecasting and skill-based scheduling process. Obtaining accurate historical data is the first step in any effective WFM process, so proper ACD and router setup to support this is critical. Agent and caller priorities can be useful but can create significant challenges in the planning and intraday management of the operation. Matching the WFM processes to the SBR design will go a long way toward achieving the efficiencies and effectiveness that SBR promises. This course will even give you the opportunity to apply and practice SBR design concepts through case study applications, helping you to learn how to determine and assign priorities in order to manage service differences optimally for your center. Outline the benefits and challenges of designing an effective SBR plan. Understand the most critical first step in the SBR process and alternatives for achieving it. 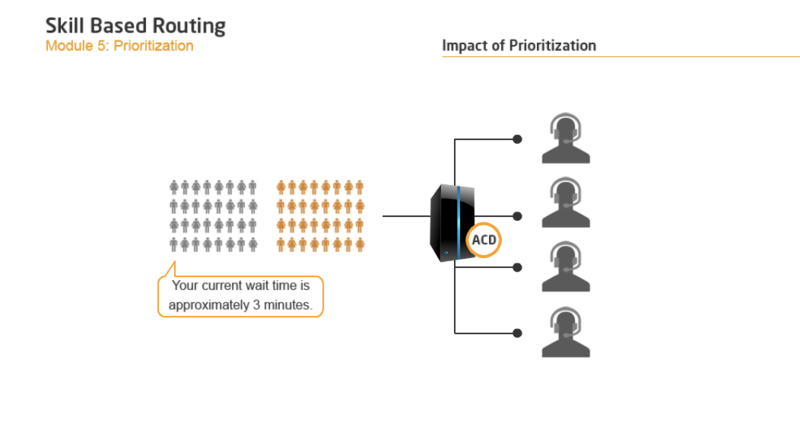 Execute the process of scheduling agents to match SBR configuration demands. Overcome the challenges of intra-day management of SBR. Roll out design concepts for progressive agent training and varied agent skill situations. We offer bulk discounts for orders containing 5 or more seats for a program or bundle. Check our pricing options for WFM - Skill Based Routing below. If you apply for bulk pricing, please contact us to place your order. The WFM - Skill Based Routing program is designed by call center experts to provide a practical and engaging learning experience. Start today.